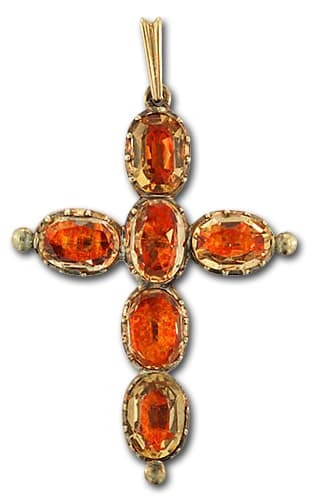 Georgian 9K Rose Gold Cross Pendant Set with Orange Foil Backed Quartz in Cut Down Collets. Foiling is the backing of a gemstone with a metallic or non-metallic sheet to improve its optical performance. The foil acts both as a reflector as well as a coloring agent. These stones were typically set in silver closed backs to shield the foil from deteriorating.